NANCY ROMERis Professor of Psychology at Brooklyn College and Executive Director of the BC Community Partnership, which offers teenagers programs in arts and academics. She is University-Wide Officer of the Professional Staff Congress, the American Federation of Teacher local representing the 20,000 full and part time faculty and professional staff of the City University of New York. 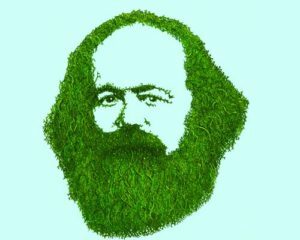 To me the role of eco-socialists is to raise transitional demands, demands that bring a broader understanding of the role of capital in creating climate change and the ways that capital-ism can be challenged by working people and people most affected by the vast inequality it has created. The struggle at Standing Rock against the Dakota Access Pipeline (DAPL) was one of the major political mobilizations of 2016, combining the demand for Native rights with the call for environmental justice. New Politics asked Nancy Romer to cover these events for us. She was at Standing Rock from November 10-15. We arrived at the Standing Rock encampment late afternoon on Thursday as the sun was beginning to go down. Driving into the site was truly amazing: it is enormous! It is a village of about 500 (probably more) tents, vans, RVs, etc, some of them huge and housing dozens of people. Lots more people who are participating in the daily activities, as I am, are staying at the Sioux-run Prairie Knights Casino Hotel. The hotel and casino are enormous too.The land defining the reservation is vast and the scenery is beautiful, calm and wide. Thousands of people have participated in the protest since it started in the spring. Can the U.S. Food Justice Movement Join the Global Movement? In the United States today, there is a fresh opening for progressive alliances. 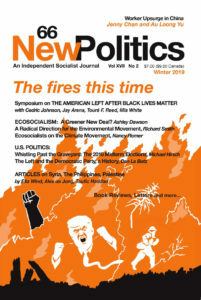 The various movements—Black Lives Matter, the Fight for $15, climate change, immigrant rights, LGBT rights, Bernie—have different roots, structures, and foci, but they share a recognition that we are being crushed by the newest form of capitalism—as they call it in Latin America, “capitalismo salvaje”1 (savage capitalism)—and that we must stand up to it with all our might, with all our people. A NEW ALLIANCE OF DEMOCRATICALLY-ELECTED GOVERNMENTS with a range of socialist programs is sweeping Latin America. New trade agreements that embrace the possibility of pan-regional alliances are being forged. Venezuela, Ecuador, and to a significant extent Argentina, Chile, Nicaragua, and Brazil articulate some policies of uplifting the poor and challenging US and neoliberal hegemony. Other nations are making their way to this list. Among these synergistic movements, no country in Latin America is better positioned to become a democratic socialist state than Bolivia.